The Parish of Our Lady & St George has existed in Walthamstow (London, UK) since 1849. However, the roots of Catholicism in the area run far deeper, and are thought to go back as far as the seventh century, when the faith was first preached to the Saxons. Originally, the nearby St Mary's Church in Walthamstow Village (founded in 1108) was the mother church of Catholic Walthamstow, and remained so until the Protestant reformation of the sixteenth century. Under the reign of Henry VIII, the practice of the authentic Catholic faith in England was illegal, and many priests and lay people paid the ultimate price for their fidelity. Little is known about how the Catholics of Walthamstow fared during these dark days. They had to hear Mass in secret as best they could, however and wherever they could. Between 1574 and 1597 the Hale family of Moons Lane (now Billet Road) were repeatedly prosecuted for recusancy (refusing to attend Anglican services). A private chapel had been licensed at Moons in 1536 and this may well have been used for secret Roman Catholic worship in the later 16th century. In 1598 William Humphrey was charged for harbouring a 'papistical woman' thought to be a common messenger between recusants, but he was never indicted as a recusant himself. Indictments of a few Walthamstow recusants continued to 1629, but in 1676 no papists were enumerated in the parish. In 1766 one Roman Catholic family was reported. This was the Bradshaw family, who may have given hospitality to the Jesuit mission conducted in Walthamstow from 1769 to 1772 by John Talbot, a priest who remained there until 1779. By 1780 there were 32 papists in the parish. Catholics were still subjected to a variety of penal laws and exclusion from civic and social life. The situation began to improve in 1791 and from 1801 Parliament frequently considered repealing the penal laws. Finally, the Act of Emancipation restored citizenship rights to Catholics in 1829, although restrictions on public worship remained for several years afterwards. In Walthamstow in the 1840s, Mass was still being said in private houses, including a house in Raglan Road, and in Brookfield Mansion on Shernhall Street, where Captain George Collard and his wife lived. As the situation for Catholics improved, the Collards were to be instrumental in the establishment of the first St George's. However, Mrs Collard was a lady of erratic temperament, who changed her faith three or four times. She tried to control the times of services, including the time of Sunday Mass. She looked upon the Church as her private property, and the priest as her personal chaplain. She held the keys of the Church and when she could not get her way she locked it against priest and people. Indeed, for a year (1853-1854) there was no Mass in the Church, but Cardinal Wiseman provided for the spiritual needs of the community by building a temporary church nearby. 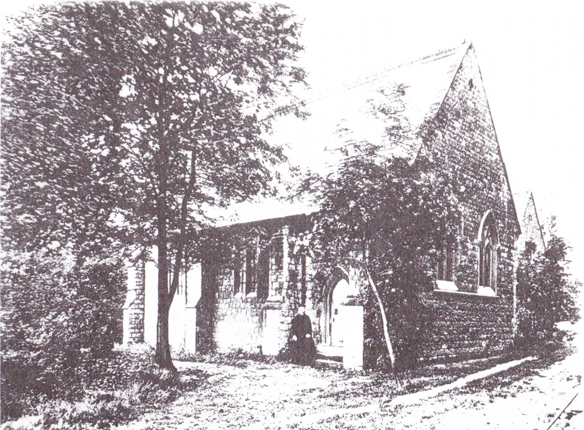 In 1854, the Church was reopened and in 1855 the trustees' title to the land conveyed to them by Mrs. Collard in 1847 was confirmed by a Chancery decree. 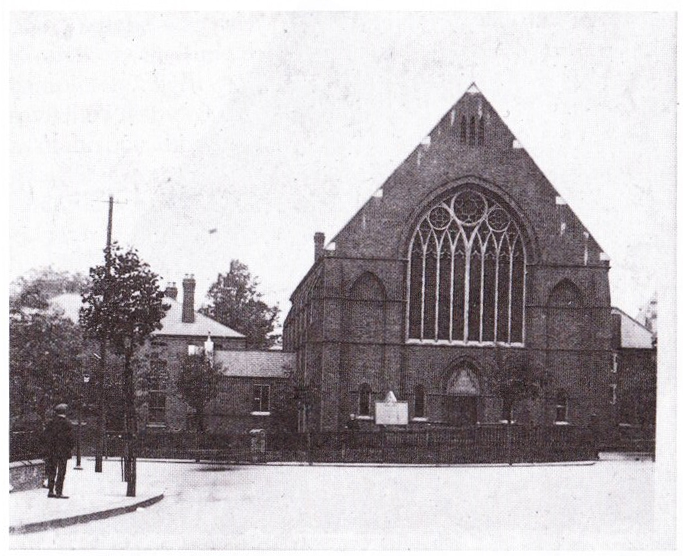 Over subsequent decades the population of Walthamstow grew substantially, and by the turn of the century the small Church was far too small to accommodate the Catholic population, which at that time was around 3,000. 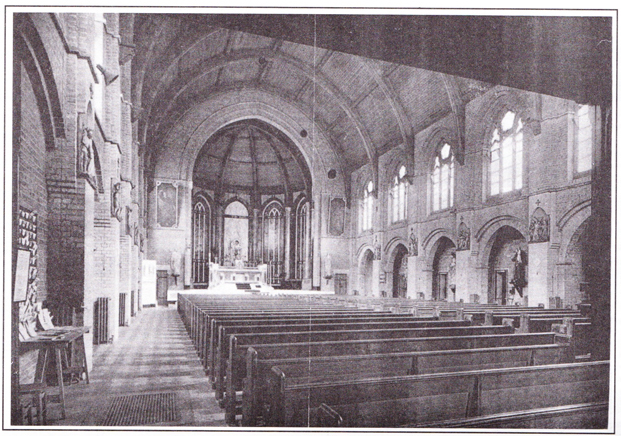 The Parish Priest at the time, Fr Martin Brannigan set himself the big task of building a large, new Church, and the second St George's was opened on the 8th December 1901 by Cardinal Vaughan. It was a massive brick building in the Early English style with circular apse and domed roof and a Lady chapel on the north side. Six other chapels were added later. 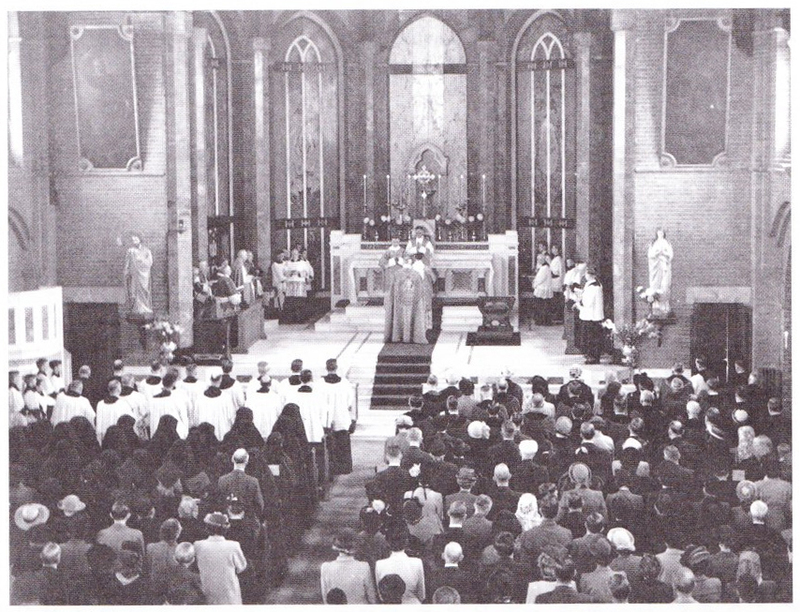 The Church was solemnly consecrated on 7th October 1925 by the Bishop of Brentwood, Dr Doubleday. The Church stood for many years, until the Friday before Palm Sunday, 2nd April 1993. On this bright, but windy day, smoke was seen to be billowing from the roof of the Church. 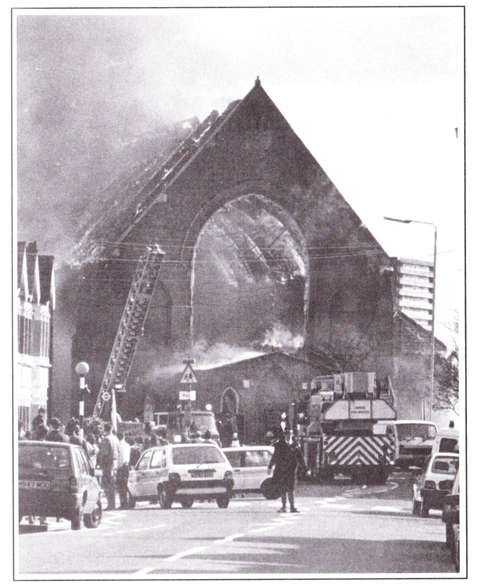 By the time the fire engines arrived, the church was completely alight. All the firemen could do was try to save the presbytery. While the cause of the fire was described as malicious, those responsible were never caught. And so, the great St George's which had stood for nearly 100 years was totally destroyed. It had been hoped to use the ruins, and rebuild from them, but they were found to be unsafe and so the remaining structure had to be demolished. The whole parish was shocked by the event but immediately a spirit of unity and hope developed, and plans were soon drawn up for the third church on the same site. The new, and current St George's was opened in 1996. 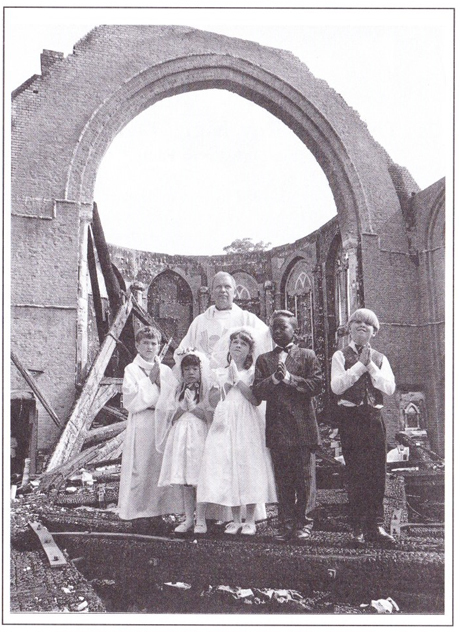 Fr Conrad Smith (Parish priest at the time of the fire) stands among the ruins with children of the parish. If you have any old photos of the parish, please contact us.